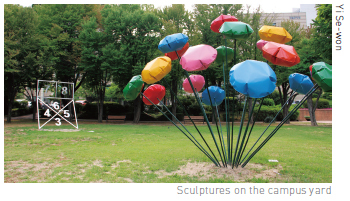 The Department of Environmental Sculpture held the University of Seoul (UOS) Environmental Sculpture Exhibition. Twenty-four sculptures have been placed around the campus. One sculpture is placed at the main entrance of the campus, four are placed in front of Cheonnong Hall, eight are in the yard of the Student Hall, six are placed beside Joongang-no (Central Street, in English), five are nearby the Law School Building, and the last one is near the Main Auditorium. They also held two events with the Student Council for enjoying the exhibition.